A leucistic cardinal enjoys Kelly McGowan’s birdfeeder outside her office at the Botanical Center. Photo by Kelly McGowan. 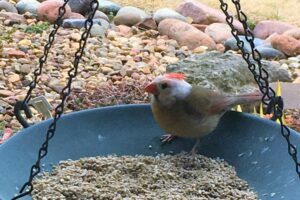 A leucistic female cardinal was seen around the Botanical Center in the early months of 2019. While it is rare, it is not unheard of. Leucism is a condition in which an animal losses pigmentation in some cells — in our case, just the feathers around the head. Charley Burwick, volunteer with the Greater Ozark Audubon Society, advised us that the condition is not always permanent, and the bird will likely replace the white feathers with the normal color when it molts again. Kelly McGowan, MU Horticulture Specialist, enjoyed visits from the leucistic cardinal this morning at the birdfeeder outside her office window. She reports that the cardinal appears to be healthy and happy. Kelly’s new friend returned to the birdfeeder with a male companion this morning. They make an attractive pair. 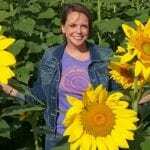 Katie Keith holds bachelor’s and master’s degrees in ornamental horticulture and landscape design from the University of Tennessee in her home state. Her passion for public gardens brought her to Springfield, Mo. to become the first Springfield-Greene County Botanical Center Coordinator for the Springfield-Greene County Park Board.